Former governor of Lagos State and National Leader of the All Progressives Congress, APC, Bola Tinubu, yesterday, described Dino Melaye as a disgrace to the Senate. His reaction came against the backdrop of last Tuesday’s shouting match between his wife, Senator Oluremi Tinubu, and Melaye during the closed-door session of the Senate. 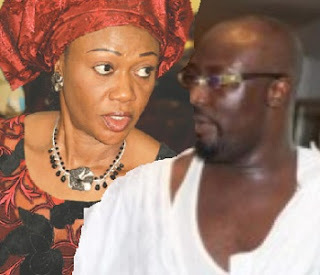 Melaye, who represents Kogi West senatorial district in the Senate, had reportedly threatened to beat up the APC leader’s wife during the altercation between them, boasting allegedly that nothing would happen if he did so. But Tinubu in a statement by his spokesman, Sunday Dare, yesterday, warned Melaye that something would happen, if he dared it. “Dino Melaye sank to the lowest ever on Tuesday. From this point, it is downhill for him. A disgrace to the Senate of the Federal Republic of Nigeria. “If Dino thinks nothing will happen if he dares to beat up another senator, then he must be living in a fool’s paradise. Things will happen,” Tinubu’s spokesman wrote on Twitter. Efforts, last night, to reach Melaye for his reaction failed as calls to his mobile number were not returned; he also failed to respond to text messages sent to his phone. However, senators representing Lagos State in the Senate, yesterday, warned Senator Melaye to desist from harassing and intimidating Senator Oluremi Tinubu or face their wrath. “We, the two senators representing Lagos East and Lagos West, having reviewed the recent happenings in the hallowed Chamber of the Senate of the Federal Republic of Nigeria, particularly at the executive session of July 12, 2016, which dwelt on the running of the Senate and now in the public domain without any denial from the affected parties, feel compelled to state as follows: “We deplore in very strong terms the use of abusive, threatening, uncouth, vulgar and un-parliamentary language by any senator against any other senator, particularly our female colleagues. “As distinguished members of the Red Chamber, we are strongly in favour of resolving any conflict that has arisen in the course of our representation and national duty through dialogue and due process and we will not be part of any solution obtained through any form of coercion, threat, intimidation and ungentlemanly conduct of the distinguished office of a senator. “We dissociate ourselves from the comments and behaviour of Senator Dino Melaye (APC, Kogi West) at the executive session of July 12, 2016, as we represent people known for finer character and nobler culture of social interaction. “We equally state that we will be part of efforts to instill and enshrine decorum and gentlemanly conduct associated with the Upper Chamber of the National Assembly of the Federal Republic of Nigeria. “While condemning the use of any vulgar and un-senatorial language in all ramifications, we particularly take offence at the use of such abusive and denigrating words against the person of distinguished Senator Oluremi Tinubu (APC, Lagos Central) as such words greatly demeaned the female gender and the hallowed chamber of the Senate.